After a lifetime of searching for the path to his father's success in the public arena, Mark instead turns to a search for the secret of his father's joy his devotion to others, and his sense of purpose. He discovers notes and letters from Sarge; hears personal stories from friends and family that zero in on the three guiding principles of Sarge's life-faith, hope, and love-and recounts moments with Sarge that now take on new value and poignancy. In the process, Mark discovers much about himself, as a father, as a husband, and as a social justice advocate. A Good Man is an inspirational and deeply personal story about a son discovering the true meaning of his father's legacy. 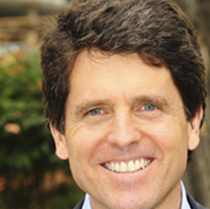 to Mark Shriver on His Time Writing "A Good Man"
Mark K. Shriver is the senior vice president of U.S. Programs at Save the Children in Washington, D.C., and a former Maryland state legislator. Shriver also started the Choice Program and served on the coalition to create the National Commission on Children and Disasters following the devastation of Hurricane Katrina. He lives with his wife and three children in Maryland. Scott Stossel’s exhaustively researched, authorized biography depicts Shriver’s connection to the historical events of the last century—the Great Depression, World War II, JFK’s assassination, the Cold War, and many more. 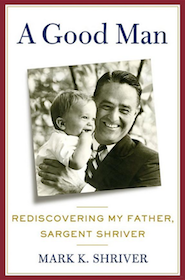 Sarge gives us a complete account of Shriver’s life, as well as thoughtful commentary on the Kennedy family, the Peace Corps, and United States and world history. Peace Corps, VISTA, Community Action, Head Start, Legal Services for the Poor, Youth Corps, Job Corps, ... Sargent Shriver invented a string of social initiatives that shaped an era and dared millions of young Americans to live out their ideals.